My Parents. Helen -- my mom -- a strong woman -- taught me assertiveness, bravery, and how to fight. She fought recurrent breast cancer for some 15 years before her death in 1988. Bob -- my dad, who died a year later -- was a quiet man of man of faith dedicated to his family who taught me to look on the brighter side of life and to be open-minded and tolerant. My little sister. Beth -- 14 years younger than I -- has struggled to employ her college training in a career in education where good jobs are hard to find. She lives in suburban Washington, DC. My wife. Julia -- a bookkeeper and administrator -- has taught me organizational skills. She likes hard work and helping people. We share common interests in good food and wine, movies, and novels. Rev. Robert Davidson served as pastor at West-Park Presbyterian Church in New York City for nearly 20 years before his death in 1993. I served as Clerk of Session of the congregation for more than a dozen of those years and worked closely with him in his ministry. In 1989, the then United Presbyterian Church (U.S.A) elected him Moderator. Rev. Davidson sensitized me to social justice issues and introduced me to techniques of community organizing that mobilize people to work together to make power structures responsive to human needs. Libertarian. Barry Goldwater informed my radical views about individual freedom: "Extremism in defense of liberty is not vice. Moderation in pursuit of justice is no virture." Social Justice Advocate. 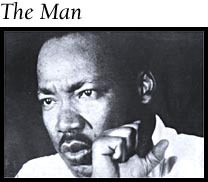 Martin Luther King raised my awareness and heighted my understanding of the plight of the poor, the root causes of economic and social injustice, and differences in cultures of people. Theologian. 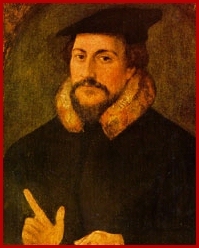 John Calvin's thinking constructed the framework of my religious tradition which emphasizes the sovereignty of God, the sinfulness of humanity, and individual conscience informed by the the Biblically-revealed Word read and understood in the presence of the Holy Spirit. In the Christian Reformed faith, action is eqully as important as worship because God demands obedience. Social Justice Libertarian. Henry George -- the socio-economic thinker -- reconciles my liberatarian and social justice philosophies. He argued that freedom and justice intersect as human labor has free access to God's gifts of land and natural resources to create wealth. Social injustice, he maintained, traces to monopolization of land and natural resources which can be prevented by taxing at 100% the rental portion of income attributable to them -- thus making land valuable to owners only as it is used wisely and productively within the context of marketplace wisdom.